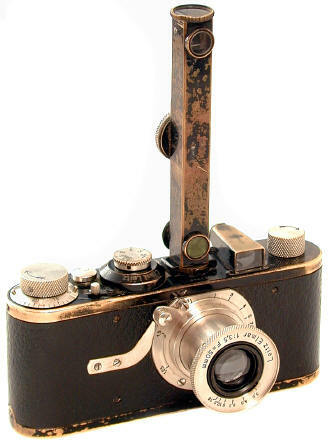 Well, here it is folks, the most important 35 mm camera of all time: the Leica A of 1925-36. Why you ask? Simple. It was the first commercially successful 35 mm camera. Without it, the millions of other 35mm cameras would not have followed -- at least not in their present form. Oskar Barnack actually invented 35 mm photography as we know it. Over 57,000 A's were made, when at the time they were very expensive. Leica's great sales from the start is a testament to the camera's filling a need, as well as to its great design. Keep in mind that commercially loaded film was not available. You had to load your own film cassettes from long 35mm rolls! While the American made Simplex was probably the 1st production 24x36 35mm camera in 1913 sold to the public, the 1925 Leica A was responsible for popularizing the 35mm film format. What's that vertical thing on the camera? The add on vertical rangefinder! The Leica A had a fixed, collapsible lens and depended upon scale focusing. What's that? The photographer set the focus distance on the lens -- and if the setting was too far off they were rewarded with out of focus pictures. 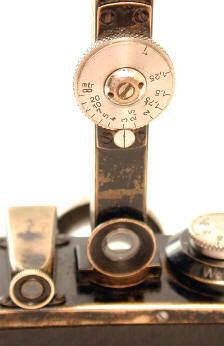 For precise focus, just attach the vertical rangefinder, look through the window on the back of the rangefinder, rotate the wheel to bring the two images into alignment, read the distance scale on the rangefinder, and then transfer the measured distance on the rangefinder to the distance scale on the lens. It was so fast and easy, it was almost like having an autofocus camera -- for 1925. Strangely enough, Leica actually produced the rangefinder BEFORE the camera as a way to measure distance. Though usually not thought of as a rangefinder camera, the Leica A is arguably the 1st 35mm Rangefinder by virtue of its add on rangefinder, which was available from Day One! The Leica A would not have succeeded without an excellent lens, and the classic uncoated 4 element triplet design 50/3.5 Elmar more than did the job. 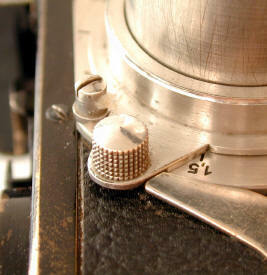 Notice that the lens and camera fittings are nickel coated, not chrome. The lens collapsed inside the body when not in use for more compact carrying. To shoot, pull out the lens and rotate it to lock it into shooting position. Forgetting to pull out the lens yields hopelessly out of focus pictures. 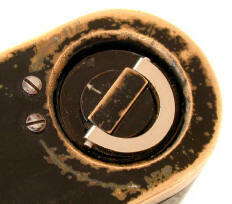 The "hockey puck" locked the lens on infinity, pushing it down unlocks the lens from infinity position. While calibrated in f/stops as we know them today (as opposed to completely different systems not used today), the Leica A's marked f/stops were not today's standard f/stops: f/3.5, 4.5, 6.3, 9, 12.5, 18. The Leica A's 50/3.5 Elmar established long Leica traditions of infinity lens locks, lens focusing levers, and of course sharp lenses. Controls Left to Right: Rewind Knob, Viewfinder for 50/3.5 Elmar fixed lens, Accessory Shoe for add on rangefinder, Rotating Shutter Speed dial with speeds from 1/500 to 1/20th plus Z (or B), Rewind Control Lever, Shutter Release, Film Counter rotating around the Film Advance Knob. 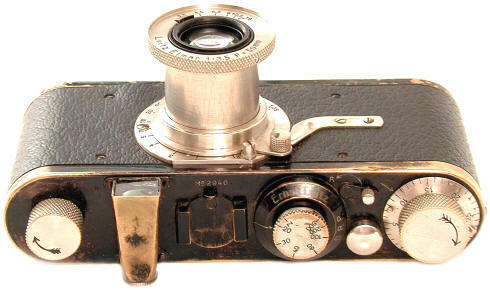 Notice that the 1925 Leica A set a new standard as far as the shape and style of control for 35mm cameras. The removable baseplate film loading established a pattern followed to this day in the Leica M7. It proved to make for a wonderful compact camera body to hold and use, but rather difficult to use load film. Leica film loading was vastly improved by adding a back door in the Leica M3 of 1954 and even more with the easy loading M4 of 1967. The round cut out on the back was for technicians to check the lens focus. 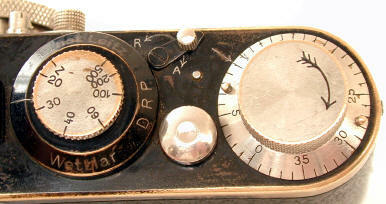 This 1926 vintage Leica # 2940 has the "Dimpled" Shutter release, and the "3 Feather" arrow on the Film Advance Knob. The baseplate release key also differs from later Leicas. For a first effort which literally established a new engineering genre, the Leica A is truly remarkable. 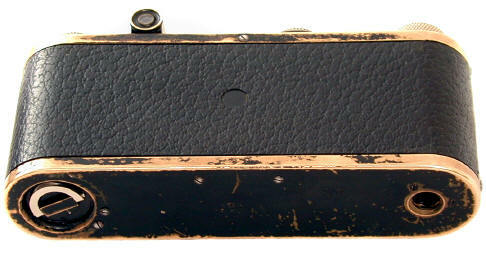 This Leica A is shown with its vertical rangefinder and original carrying case. It's worth mentioning that Leica A's in original condition are much rarer than their production numbers would seem to indicate. 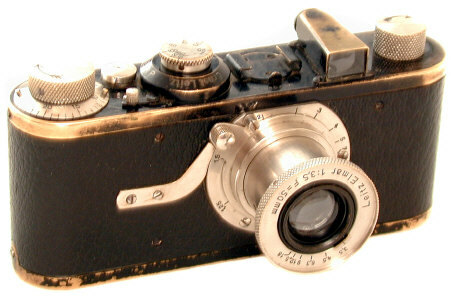 As Leica brought out model after model built on the same basic body, the factory offered conversions updates to the newest model. 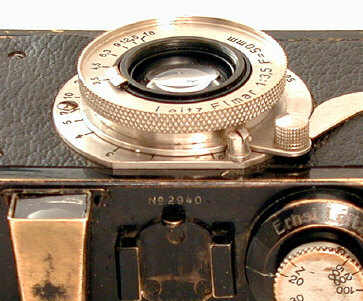 It is not unusual to see Leicas with early numbers converted to Leica II or III's. There is no way to be sure how many Leica A's were converted to other Leica models, but in my own experience I estimate 3 out of 4 early Leica A's in the 1st 10,000 cameras I've encountered were converted. Unlike many cameras that have come and gone since 1925, you can still buy film for the Leica A just about anywhere -- not bad, not bad at all. Revised: November 25, 2003 . Copyright � 2002 Stephen Gandy. All rights reserved. This means you may NOT copy and re-use the text or the pictures in ANY other internet or printed publication of ANY kind. Information in this document is subject to change without notice. Other products and companies referred to herein are trademarks or registered trademarks of their respective companies or mark holders.